As I wrap up another year of photoblogging, it is time to reflect back on the past year’s adventures. In reviewing the thousands of photos I produced this year, it was not surprising to me and, if you follow me for any length of time, to you either that water is featured in 40% of my selected “Best of” photos. The trip to the southwestern United States made up another 30% which is, again, not a surprise. The remaining 30% is made up a triad of Sports, People and Wildlife. I hope you enjoy them as I proudly present View Infinitum’s Ten Best Photographs for 2013. 1. During a cold day back in January, I was accompanied by fellow Ithaca photobloggers to view the ice encased Ithaca Falls. While I did not share this photo in the accompanying post, it has become my favorite from the adventure. I shared it a couple of weeks later with an appropriate quote. 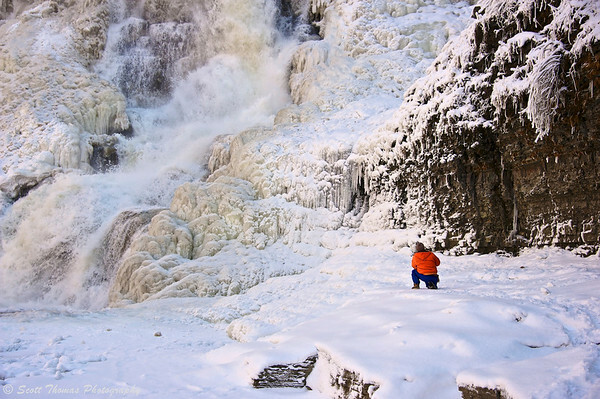 A lone photographer in front of ice encased Ithaca Falls in Ithaca, New York during the winter. Nikon D700/28-300VR, 1/160s, f/6.3, ISO 200, EV +1.0, 68mm focal length. 2. When I heard the Snow Geese were passing through upstate New York, I set out on a quest to find them. I was rewarded with this spectacular scene of thousands of snow geese launching into the sky above Cayuga Lake. 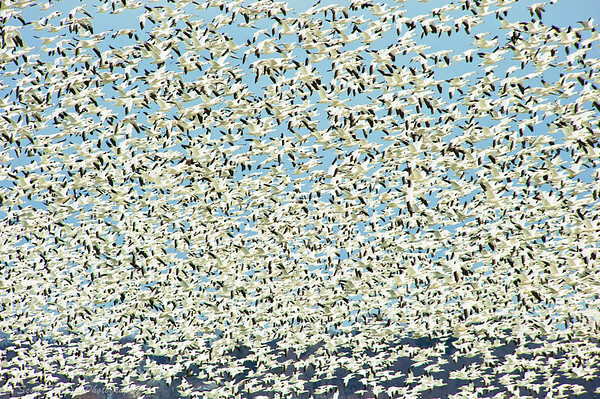 Thousands of Snow Geese fill the sky over Cayuga Lake near Seneca Falls, New York. Nikon D700/80-400VR, 1/400s, f/10, ISO 200, EV +0.3, 400mm focal length. 3. With apologies to the Syracuse Crunch fans, my first year of photographing Crunch games concluded with the awarding of the American Hockey League’s championship trophy, The Calder Cup, in Syracuse. Unfortunately, it was the Grand Rapids Griffins who did the celebrating. 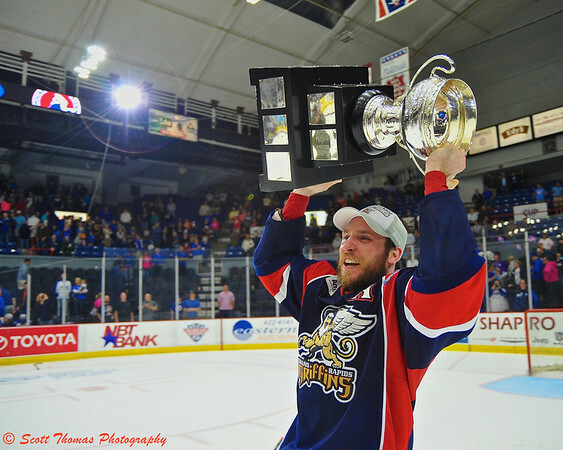 Grand Rapids Griffins Brennan Evans (44), who scored the game winning goal, hoists the Calder Cup at the Onondaga County War Memorial in Syracuse, New York on Tuesday, June 18, 2013 after his team defeated the Syracuse Crunch in a Best-of-7 game series, 4 to 2. Nikon D700/24-85G, 1/250s, f/3.5, ISO 1000, EV +0.3, 24mm focal length. 4. Some photographs we take can mean something very special at the time and later grow into something more. This photo of my sister and her husband celebrating 25 years of marriage is special in its own right. What I did not tell you at the time was my sister had been diagnosed with breast cancer just three days before this photo was taken. She has since had surgery and chemotherapy and, at the time of this post (knock on wood), has beaten the cancer and is on her way to a full recovery. 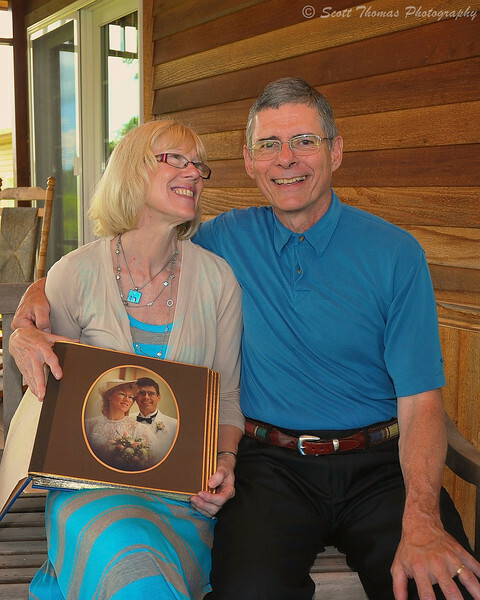 A couple celebrating their 25th Wedding Anniversary holding their wedding day portrait. Nikon D700/24-85G, 1/60s, f/8, ISO 400, EV 0, 34mm focal length, bounced flash. 5. Ah, looking back on my post for the assignment on Summertime here in late December, makes me pine for the longer, warmer days of summer. I only have six months to wait. 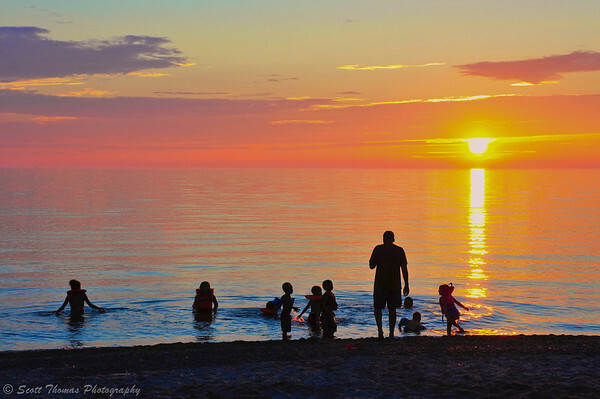 A group of swimmers enjoying Lake Ontario waters as the Sun sets at Brennan’s Beach RV Campground and Resort near Pulaski, New York. Nikon D700/28-300VR, 1/125s, f/16, ISO 800, EV 0, 85mm focal length. 6. One of my utmost pleasures is discovering new places to photograph the beauty of nature in my home state of New York. 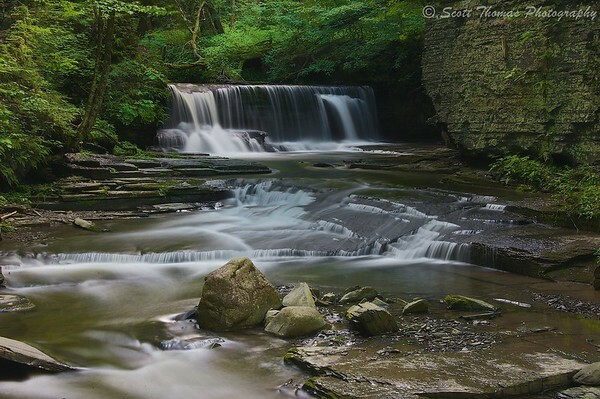 In August, I visited Fillmore Glen State Park for the first time and became enamored with Upper Pinnacle Falls. Upper Pinnacle Falls at Fillmore Glen State Park near Moravia, New York. Nikon D700/28-300VR, 15s, f/32, EV 0, 62mm Focal Length, tripod and 3-stop ND filter. 7. From the quaint beauty of Fillmore Glen, I photographed the power and magnificence of Horseshoe Falls at Niagara Falls, Ontario, Canada a couple of weeks later. 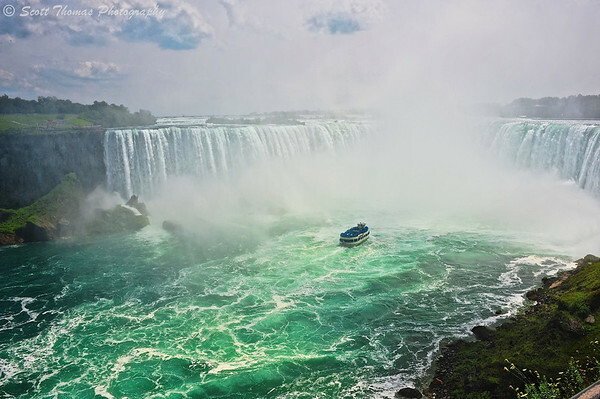 Maid of the Mist VII tour boat full of blue raincoat clad people face Horseshoe Falls on the Niagara River at Niagara Falls in Ontario, Canada. Nikon D700/28-300VR, 1/160s, f/16, ISO 200, EV -0.3, 28mm focal length. 8. The grandeur of the Grand Canyon is something which really must be experienced in person. The photos I took there will forever bring back those memories. This photo now hangs in my living room as a 20×30 inch canvas print. 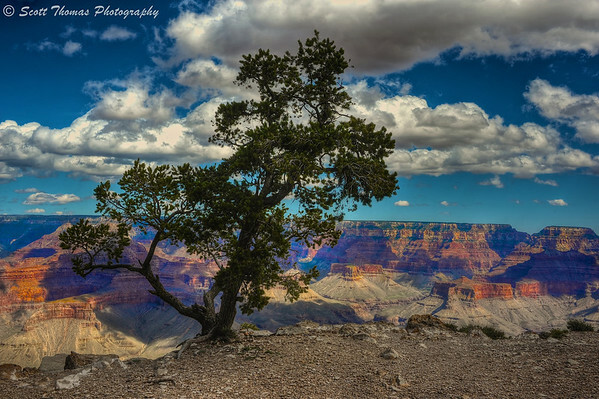 Pinyon Pine tree growing on the canyon rim at Yaki Point at Grand Canyon National Park in Arizona. Nikon D700/28-300VR, f/22, ISO 200, EV -0.3, 38mm focal length, HDR image. 9. My wife gave me the Sigma 15mm f/2.8 EX DG Fisheye Lens as a 30th Anniversary present. While I knew I would have fun with it, I was surprised to find how useful it was in landscape photography. 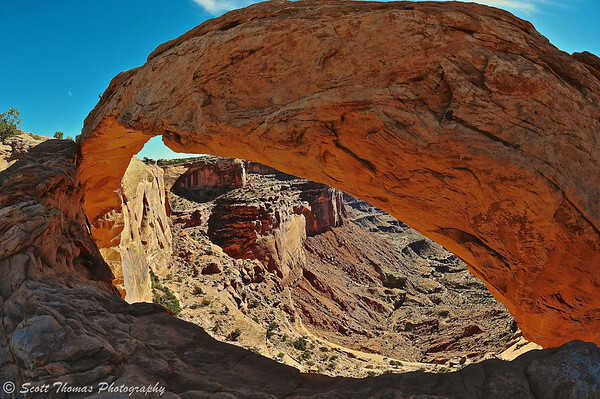 This photo of Mesa Arch in Canyonlands National Park is a prime example. Mesa Arch in Canyonlands National Park near Moab, Utah taken with a Fisheye lens. Nikon D700/Sigma 15mm, 1/100s, f/11, ISO 200, EV -0.3. 10. It is said, the harder it is to do something, the more you appreciate the accomplishment. That feeling of accomplishment was very much in my mind when I returned from the sunset hike to Delicate Arch in Arches National Park near Moab, Utah and saw this photo on my computer screen. 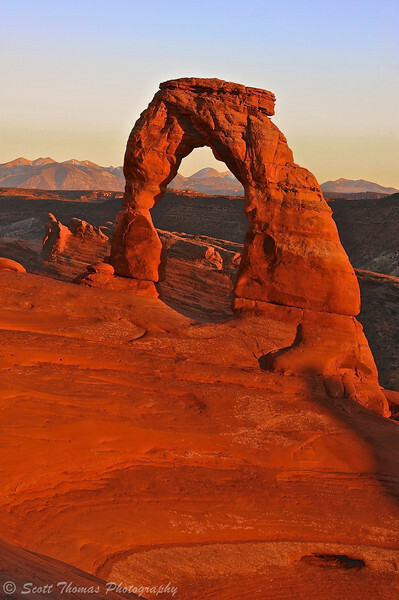 Delicate Arch in sunset light at Arches National Park near Moab, Utah. Nikon D700/28-300VR, 1/20s, f/16, ISO 200, EV -0.3, 56mm focal length, tripod. 2013 was an exciting year for Views Infinitum. 2014 is lining up some challenges. You may have noticed a drop off in blog posts since around Thanksgiving. My family is experiencing some health issues which have taken up a lot of my time. For the foreseeable future these issues will continue to take time away from here and other photographic projects. I will be posting the Weekly Views but other days may fall by the wayside. I hope you will hang in there with me until I can get back to my usual schedule. For now, take care and here’s to a Happy and Healthy New Year. This entry was posted in Photography and tagged 28-300mm, ahl, american hockey league, arches national park, arizona, birds, calder cup, canada, cancer, canyonlands national park, cayuga lake, championship, delicate arch, fillmore glen, finger lakes, fisheye, flying, grand canyon, grand rapids, griffins, hdr, horseshoe falls, ice, ice hockey, ithaca, ithaca falls, Lake Ontario, landscape, mesa arch, moab, new york, niagara falls, nikon D700, ontario, seneca falls, sigma 15mm, sister, snow, snow geese, southwestern united states, spring, state park, summer, sunset, syracuse, tree, upper pinnacle, utah, vr, war memorial, water, waterfalls, wedding anniversary, winter. Bookmark the permalink. Mighty and impressive, Scott. Great year of photo-taking, sir. My favorite is the thousands of snow geese taking flight here in our upstate New York. It was quite an experience with the sounds of all those wings beating at once, Mark. Won’t be long before they will be there again. A year of lovely and exciting photos, Scott. I hope your family will be as well as possible. Lovely work – thank you for sharing these moments from the year. Thank you for saying that, Dawn. Very beautiful photographs. So real, so clear! You have a special talent. May your family be blessed with good health in the coming days & the new year.. Okay, you know there’s a couple of these I need the HD version of for my wallpaper. Just amazing stuff; you’ve progressed so much over the years. Wonderful work Scott! It has been a pleasure following your work and getting to know you guys a bit. I look forward to 2014 and new adventures, please let us know if we can be of any help for you and the family. great review, it has been an exciting year indeed! Thanks for sharing it with us Scott, and all the very best for 2014! What a wonderful year of photography ! I love the Winter geese as well as the Pynion Pine Tree. The picture of your sister and husband is touching too, I wish her the very best. All the best to you and yours, Scott.